I went to see this in preview on Thursday 20 June. I wanted to see the show as I LOVED the book as a child. I remember it being read to us at primary school, and I was completely captivated by the story of Charlie Bucket. his family, Willy Wonka, and the amazing chocolate factory. So I was really excited about seeing this new version of the story - a brand new West End musical. I booked to see it through lastminute.com, on a preview, on the cheapest ticket price - I just wanted to experience the show. So I was way up in the Balcony in the Gods. Credit where credit is due. This show is BIG. Which means that it reaches all the way up to the Gods. Although I was right up at the top, in the Balcony, I felt that I got the full experience and I did not feel short-changed. You could see all the action on the stage and the actors worked the sightlines so you could always see them whereever you were seated. I really appreciated that. The Balcony was full of children and the sense of anticipation and excitement just prior to the start of the show was palpable. There was a real buzz in the air. I LOVED that! The story is very pertinent and relevant to today and the age of austerity, as it tells the story of a poor boy, Charlie, from a very underprivileged background, who is nevertheless a very good boy, and is rewarded with the prize of a lifetime - a Golden Ticket to visit the amazing Willy Wonka Chocolate Factory. There is a huge amount of wish-fulfillment in the story, but many people, adults and children, will be able to identify with Charlie and his life. The show is very clever and imaginative and, whilst sticking to the core story and plotline, it does add in a few modern twists, all of which work very well. There are some great gags in the show too, for adults and children - adults should look out for the reference to Lady Chatterley's Lover! The show has two very distinct halves. 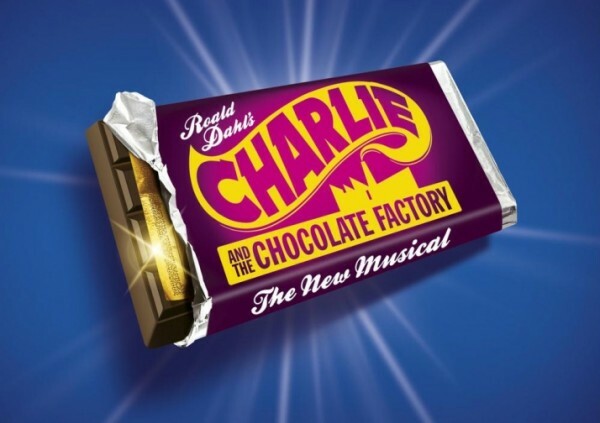 The first half introduces us to Charlie and his extended family, his life, the story of Willy Wonka and the Chocolate Factory, the whole Golden Tickets competition, and the five children (including Charlie) who win the Golden Tickets. The children turn-up on the red carpet, walk into the factory for their prize of a lifetime, and the curtain closes for the interval. The second half follows the adventures of the children and their parents inside the Chocolate Factory, on a tour led by Willy Wonka himself. The story as told in the musical stays very close to the book, which is as it should be! The actor playing Charlie on the night that I saw the show was just fantastic. In fact, all the child actors in the show were just superb. The child characters were all very true to the book. I also have to give a special shout out to the Oompa-Loompas - they really have to be seen to be believed! Random comment. It was a pleasant, and totally unexpected, surprise to see Paul J Medford playing Mr Beauregarde. I was not so sure about Willy Wonka. I think Douglas Hodge needs to make a decision on who and what Willy Wonka is - is he eccentric, is he mad, is he a dreamer, is he a maverick, or is he just evil? You can interpret and play the Willy Wonka character in a myriad of ways. I was unsure at the end of the performance where on the "mad" and "evil" spectrum Hodge had placed his Willy Wonka. To sum up, this is a big old-fashioned traditional West End family show, with very high production values (especially the set, the costumes, the special effects and the staging). It was a spectacle and it was spectacular. It was a real delight to experience the show. Hats off to this show. This was a preview, the Balcony was packed with children and young people, and there was huge excitement and anticipation in the air. The show really engaged the children and they were attentive throughout. It was a real pleasure and a delight to see so many children fully engaged at the theatre. What a fabulous show. A real delight. Absolutely delicious! It was a spectacle and it was spectacular. A good old fashioned big family West End show which will engage and delight people (children and adults) of all ages. I would especially recommend the show to anyone who has children and who wants their children to experience the sheer magic and the wonder of theatre. Highly recommended! - Get your tickets in now!